Though Pilot's advertising claimed they had been in business since 1908 and the company had used several different names during that time, "Pilot Electric Manufacturing Company" was officially founded in 1922 by Isidor Goldberg in Brooklyn, New York. Pilot Electric Manufacturing Company also claimed to be "The World's Largest Radio Parts Plant" in the twenties and they did build all of the parts supplied with their kits. Some of the famous employees of Pilot were Robert Kruse, Alfred Ghirardi and John Geloso. David Grimes was a Contributing Editor for "Radio Design" - Pilot's magazine. Though not the first Shortwave receiver kit offered by Pilot, the three-tube "Wasp" was certainly their first really popular Shortwave receiver kit. In 1928 the selling price was $21.75 including the coils. The "Wasp" was designed by Robert Kruse and Milton B. Sleeper. The plug-in coils selected the tuning ranges that covered 500 meters to 17 meters or about 600kc up to 17.6mc. A complete coil set featured five coils each with color-coded handles for identification. The three tubes were usually 201-A and the circuit used a regenerative detector followed by two stages of transformer coupled AF amplification. The kit included detailed instructions along with an assembly drawing. Builders were warned to adhere to the wiring layout shown on the drawing or performance would suffer. The circuit was built on a bakelite board for the chassis and a mahogany colored bakelite panel. The "Wasp" was introduced just as Shortwave Broadcasting was beginning to grow and everyone wanted to tune in to stations located in foreign countries. The "Wasp" was very popular and soon spawned a newer, more sophisticated successor, the "Super-Wasp." 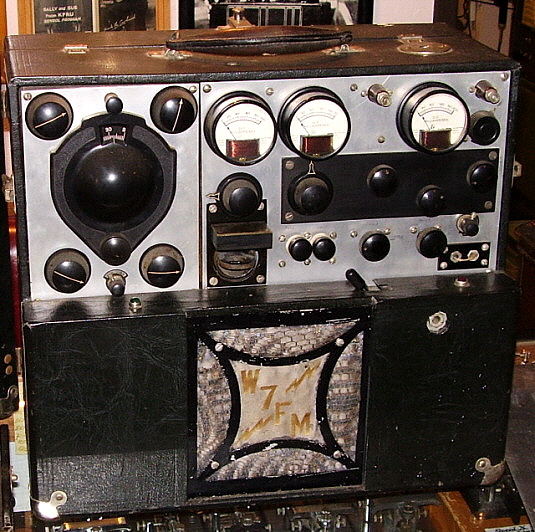 The four-tube "Super-Wasp" kit was introduced in early-1929 and featured a screen-grid tube for an RF amplifier along with regenerative detector and two-stage AF amplifier. The "Super-Wasp" kit sold for $29.50 including the five pairs of plug-in coils providing tuning coverage from 500 meters to 14 meters or about 600kc up to about 21.5mc. Detailed instructions, including a full size blue print, made assembly relatively easy and assured that each "Super-Wasp" could perform pretty much as expected. Since these were kits though, build quality was highly variable and dependent on the assembler's experience. Pilot's magazine "Radio Design" was always including updates along with suggestions for improving performance, consequently "Super-Wasp" receivers are sometimes found today having modifications or non-original parts. The stock circuit used a type 22 screen-grid tube as an RF amplifier, a 201-A as a regenerative detector and a 201-A tube as the first AF amplifier and a UX-112A as the second AF amplifier. The user could substitute a 201A for the last audio stage and reduce the plate voltage and bias voltage if a UX-112A was not available. To the right of the K-110 is one of the modular units Pilot called "Redi-Blox." This one is a single-stage transformer input audio amplifier using a type UX-112A tube. This module could be added for a third audio amplifier stage if the user thought it necessary. Pilot offered "Redi-Blox" assembled modules in the late twenties to enthusiasts to help ease the mechanical side of kit building. Around the time that the "Super-Wasp" was introduced, Pilot changed the name of the company to "Pilot Radio & Tube Corporation" (April, 1929.) "Super-Wasp" receivers were quite popular and sometimes were found in ham shacks of the late twenties and early thirties. By today's standards, the "Super-Wasp" is a very primitive shortwave/ham receiver but performance can be surprisingly good if the operator has patience and is willing to put in a few nights learning how the "Super-Wasp" works. All controls interact with each other making tuning sometimes tedious and demodulating SSB or CW signals requires the detector to be oscillating which increases the instability. However, patience will be rewarded and it is fun to use a 1929 battery-operated receiver to monitor one of the many AM ham nets on 80 meters, especially when running the audio to a vintage horn speaker - talk about "broadcast quality audio" - well, 1929 style anyway! The improved "Socket-Power" A.C. "Super-Wasp" kit was available by late 1929 and sold for $34.50. The tubes used were a type 24A cathode and screen grid tube for the RF amplifier, a cathode type 27 for the regenerative detector and two 27s for the AF amplifier. All of the tubes operated on 2.5vac at 7 amps for the heaters and the K-111 power pack supplied all of the A+ and B+ voltages required. The lower right-hand switch was wired back to the K-111 to provide an "on-off" switch at the receiver. The first AF amplifier was a resistance coupled amplifier while the second AF amplifier was transformer coupled along with an output transformer. There was a considerable design effort put into the A.C. Super-Wasp to eliminate hum since most operation was going to be using earphones. Hum reduction was one of the reasons for the RC coupled AF stage. Pilot also stipulated that only their own Pilotron tubes would perform correctly in the A.C. "Super-Wasp." Pilot plug-in coils are used for five tuning ranges covering 600kc up to 21.5mc. Shown to the left of the K-115 is the K-120 Audio Booster Unit, another Pilot module (though it is not called "Redi-Blox") for builders, that could be used if loud speaker volume was desired. All of the Pilot "Wasp" and "Super-Wasp" receivers found today will vary greatly in the quality of workmanship. Since these receivers were kits, the assembler may have had little or no experience in soldering, wiring or mechanical building. As a result, don't be hasty to judge a poor performing set as a "bad design." Check the receiver over carefully. An inspection of the soldering will usually be a clue into the level of workmanship you will encounter in your receiver. When everything is correct, the Pilot "Wasp" and "Super-Wasp" receivers are fine performers considering their vintage and a lot fun to use. National Company, Inc. - SW-5 "Thrill Box"
The National Co. started in business manufacturing toys and parts in 1914 (as the National Toy Co.) By the mid-twenties, National Co., Inc. had long ago dropped the "toy" from their name and was supplying parts for the Browning-Drake BC receiver kit and also started producing radio parts. Mechanical Engineer James Millen joined the company as General Manager and Chief Engineer in 1928. Millen was a Stevens Institute graduate and an enthusiastic ham so it was natural that he guided National into the ham/shortwave receiver market. This move happened to coincide with the new and developing shortwave broadcasting which was becoming popular with a new audience, the "shortwave listeners" or SWLs. National introduced the SW-5 "Thrill Box" in 1930. 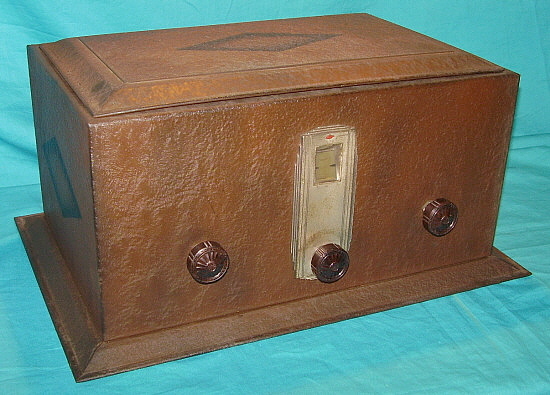 The name "Thrill Box" implied how exciting it was for the SWLs to receive foreign broadcasts direct from around the world. Though primarily designed for the SWL, the SW-5 could also be found in many ham shacks in the early 1930s. It was an expensive receiver with selling prices usually over $100 with the power supply. Robert Kruse, of the Pilot Wasp and Super Wasp fame, was involved in some of the design work in developing the SW-5 through his laboratory in Hartford, Connecticut and with several visits to National's lab. 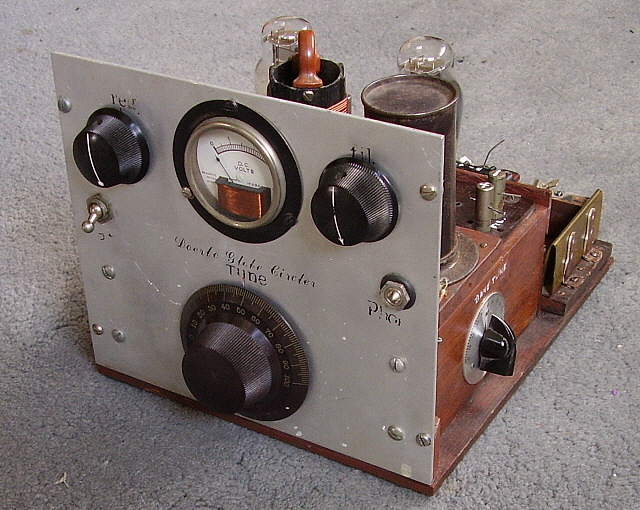 The circuit was a five tube receiver using a regenerative detector (24-A) with TRF stage (24-A,) audio driver (27) and P-P audio output (2-27.) The coil sets initially covered 1.5 to 30MC in five sets but eventually several other coil sets were added along with bandspread coil sets. The first coil sets were color coded for identification. The receiver was powered by a separate power supply that provided the 2.5vac filament voltage and approximately 180vdc B+. The tuning dial was illuminated and projected onto a frosted viewing screen. The left hand control is the regeneration and the right hand control is an antenna trimmer adjustment. There was a "Battery Model" SW-5 available and a special "Low Drain Battery Model" that used 2-volt tubes that ran on an air-cell battery that was supplied with the receiver. There was also a "Special Broadcast Model" that had P-P 45 tubes in the audio output. Early SW-5 receivers may have been available as a kit similar to the Pilot Wasp sets. Some National receivers (SW-5 and SW-3 mainly) will have a decal or label stating that the unit was built at Jackson Research Laboratory, however this was a company that was solely owned by National and was located adjacent to the National plant. 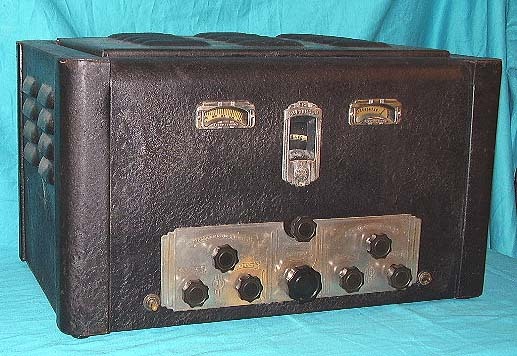 Labeling receivers as built at Jackson Labs was a form of product protection that was the result of a broad suit brought against all radio manufacturers by Cardwell sighting the use of their variable condenser patent. The suit was not successful but National kept the Jackson name around for a while afterwards. Go to "Military and Commercial Communications Gear Part 1" to see and read about the U.S. Navy RAD-2, a National SW-5 built for shipboard use in 1932. National introduced the three tube SW-3 in 1931. It was a regenerative detector with RF amp and AF amp utilizing plug-in coils. There was an AC model that ran off an accessory National power supply and a DC model that was operated with batteries. The DC model also had a switch under the lid to disconnect the A battery. James Millen and the National engineers put considerable effort into the SW-3 design to achieve maximum performance in a three-tube regenerative receiver. Shielding was carefully developed as was the coil design to allow both general coverage coil and amateur bandspread coils to be used. The end result was a little receiver that had amazing capabilities and was very stable at the point of oscillation. The SW-3 had a long production life and was produced in fairly large numbers. Coil sets were available for a wide range of frequencies from longwave to 30MC, along with the bandspread sets for the amateur bands. Later, the SW-3 became so popular as a stand-by receiver that National even offered it after WWII for a short time as the SW-3 "Universal" using three octal tubes. Parts and coils were available from National up well into the fifties. Probably the best testament to the SW-3 performance is in a photograph that is in a mid-thirites QST showing a ham station that used a full-size rack Collins built transmitter along with the station receiver - an SW-3 - certainly not typical but it says something about the SW-3 performance capabilities. Oscar Hammarlund immigrated from Sweden in 1882 to work for the Elgin Watch Company. In 1886, he became Superintendent of Western Electric's Chicago plant. Six years later, Hammarlund started working for the Gray National Company. His main project there was the Teleautograph machine. In 1910, Hammarlund founded his own company, The Hammarlund Manufacturing Company. Initially, the company built gadget-type devices but soon became involved with Western Union call boxes. An interest in wireless led the company into the radio component business and their variable condenser designs became an industry standard. In the mid-1920s, Hammarlund formed a partnership called Hammarlund-Roberts Co. specifically to offer kits for AM Broadcast radios using Hammarlund parts. By 1930, home radio technology had evolved to the point where kits were no longer practical or popular and Hammarlund-Roberts went out of business. That didn't affect Hammarlund Mfg. Co., Inc. since they were ready to enter into the shortwave receiver market with the introduction of their new Comet All Wave Receiver, a superheterodyne receiver, in 1931. 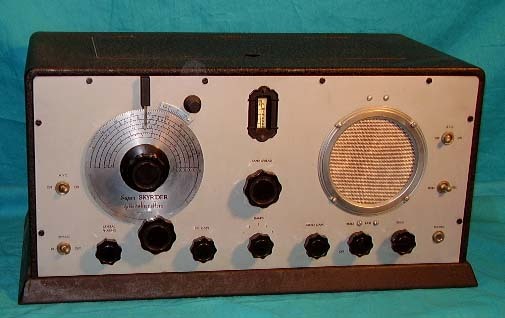 Before the Comet was introduced however, Hammarlund offered a three-tube shortwave receiver as a kit. It was patterned after the Pilot Wasp and its sales most likely gave Hammarlund an interest in entering the shortwave receiver market. With the Comet's 1931 introduction, Hammarlund decided to offer a real improvement to the typical shortwave receiver of the day. At the time, the majority of hams and many professionals considered the regenerative detector (with TRF stages proceeding it) to be the most sensitive type of receiver. It had a very low noise figure and with the proper antenna and operator skill, reception results could be amazing. The superheterodyne on the other hand, while fine for broadcast reception, was considered too noisy and not sensitive enough for acceptable shortwave performance. Hammarlund hoped to prove that with careful design and quality construction a shortwave superhet could easily outperform the regenerative receivers in every comparison. Arguably, the Comet and its later successor, the Comet Pro, changed how SWLs, Hams and Professionals listened to shortwave signals. It was the first successful commercially-built shortwave superheterodyne offered to the communications receiver market (ham or professional.) Hammarlund advertised the Comet Pro as "The World's Finest Shortwave Receiver" and it certainly was built with high quality parts and high quality mechanical assemblies. Performance for the time was superb. The first versions of the Comet Pro (actually the Comet All Wave Receiver) used 24A, 35, 27 and 47 type tubes in an eight tube circuit that had no RF amplifier and utilized two unshielded plug-in coils - WL = Wave Length (mixer) and OSC = Oscillator - to change tuning ranges. The receiver was sometimes installed in a console cabinet. The receiver had a built-in power supply (with type 80 rectifier,) used a field coil speaker and came with a set of four pairs of coils covering 250M to 16M. An optional AM BC band (240-550M) coil set was available. The plug-in coils were wound on ceramic forms and had wooden handles for easy removal. Early table top cabinets were made of wood (painted black) with a metal front panel. 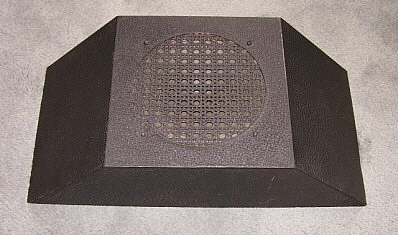 In 1932, the audio output 47 was changed to a 27 and the field coil speaker connection eliminated. An earphone jack was provided in parallel with the audio output that was a direct plate connection. This implies that an audio output transformer would still be used at the loud speaker or that an input transformer would be used for the sometimes required external audio amplifier. Individual shields for each plug-in coil were added to this version. The OSC coil wiring was changed at this time. Additionally, "Pro" was added to the Comet name, implying that the receiver had evolved into a "professional level" of quality and performance and, by January 1933, the Comet Pro was fully a shortwave communications receiver. The tubes had been changed to type 57 and 58 types along with the addition of an audio output transformer to couple the 2A5 audio output to a 4000 ohm Z load - usually a loud speaker with matching transformer. The new audio output transformer also had a tapped winding for the earphone output. The antenna input was changed to allow a dipole feed line to be used and the WL coil's wiring was changed to accommodate the new antenna connections. The standard cabinet had been changed to an all-metal construction, however the wooden table top cabinet was still available on request. Later in 1933, a crystal filter option was added, then a 10M coil set option and finally, in Sept.1933, an Amplified AVC option was offered requiring the addition of a 2B7 tube to the circuit bringing the tube count up to nine. The "arc" dials set the WL and OSC condensers and then bandspread (the vertical dial) is used to tune in stations around the general settings of the WL and OSC condensers. The bandspread dial is illuminated and projected onto a frosted viewing window. The BFO adjustment is a "swing-arm" lever accessed under the lid of the cabinet. The Comet Pro listed for $150 not including tubes but usually sold for around $115 complete from discount dealers like Leeds. The usual sales procedure was to offer the Comet Pro chassis and then add options like the metal cabinet, Crystal Filter, AVC and tubes which then pushed the selling price up to around $150. Production continued up to early 1936. Hammarlund referred to the Comet Pro as a "Professional Receiver" and it was indeed used by many professionals, both military and commercial. It was also taken on several expeditions to the Arctic and Antarctic. The Comet Pro was also popular with amateurs and could be found in many ham shacks in the thirties. For its time, the Comet Pro was a first-class superheterodyne receiver that was well-built and performed quite well when compared to its early competition that was mostly composed of homebrew regenerative TRF receivers. 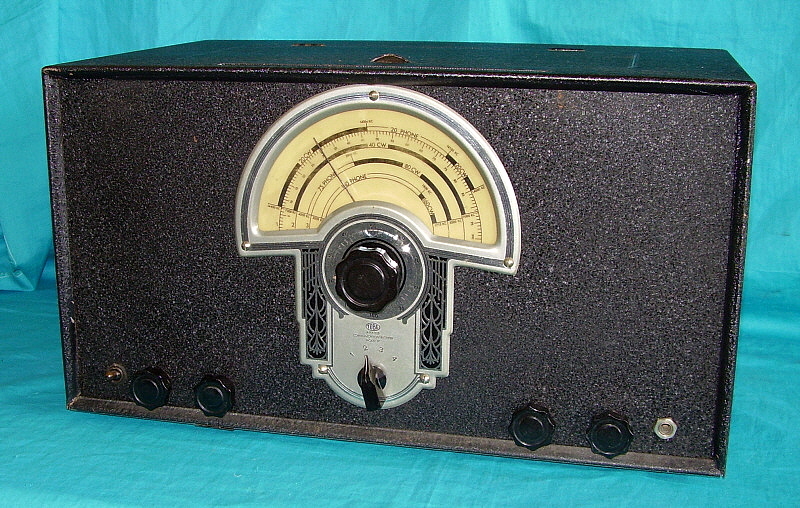 Eastern Radio Specialty Company was located in New York City and built many different kinds of ham accessories during the mid-1930s. Their brand name was "PEAK" and the P-11 Pre-selector was probably their most successful product. 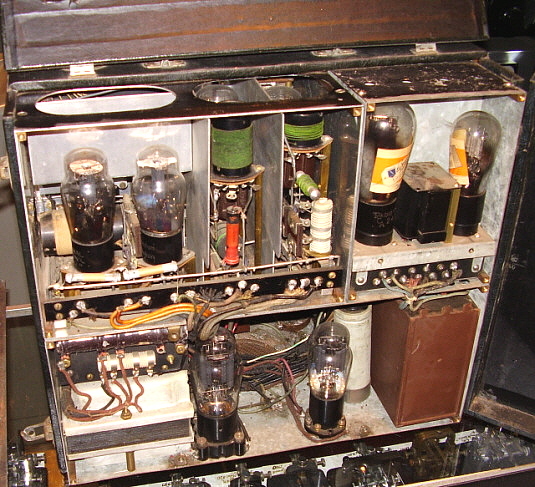 The P-11 used two type 58 tubes as TRF amplifiers. The tuning range was from 200 meters down to 14 meters (1.5 to 21.5MC) in three tuning ranges using built in coils. The P-11 had a built-in 2.5vac transformer to supply the tube heaters and the dial lamp with power but B+ had to come from the receiver. This was usually easy to tap into and the current draw of two RF amplifiers was going to be minimal. The circuit used electron coupled variable regeneration for its gain control (left knob.) The power on switch (right knob) also controls the routing of the station antenna as either bypassing the P-11 in OFF or through the P-11 when ON. The PEAK P-11 listed for $33.00 but, if the purchaser was a licensed ham he was automatically given a 40% discount from Eastern Radio Specialty, net price was then $19.80. The P-11 was first advertised in December 1934 QST. 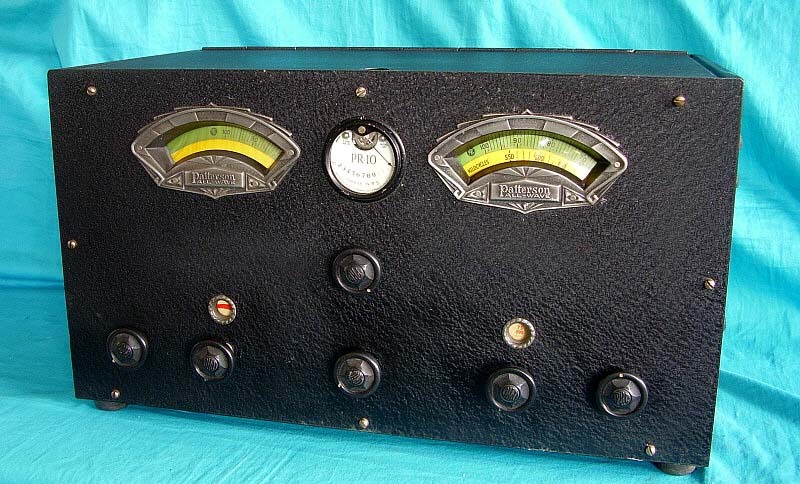 The very rare (but equally famous) National Company's AGS receiver had its origins with their Department of Commerce Airways Receiver, the RHM (shown in photo below) The RHM was designed to supply "state of the art" receivers for airports in 1932. At the time, airports and air navigation were both growing and developing. Communications between pilot and tower required the best equipment and air navigation, including the various airways remote beacon stations, also needed improved communications equipment. National was given the contract for the ground receivers, General Electric was given the contract for the ground transmitters and Aircraft Radio Corporation was given the contract for airborne communications equipment. National was going to build their first superheterodyne to fulfill this contract and it seems likely that Herbert Hoover Jr. and his West Coast design team would be involved in some of the electronic engineering work of the RHM. National provided the mechanical engineering and the ability to produce the receivers in the quantity required. The RHM used nine tubes and tuned from 2.3mc up to 15mc. Most airport communication AGS installations also included a Type 58-C Monitor Receiver that allowed receiving two separate signals simultaneously. The RHM rack also included a dual power supply, panel rack holder for the spare coils and a rack mounted loudspeaker. photo left: AGS-X sn: F-151 from 1934. This receiver has its complete set of 27 coils. 15 general coverage coils for five ranges from 1.5mc to 20mc and its complete bandspread coil set for 160M, 80M, 40M and 20M coverage (12 coils.) The second coil holder is mounted on top of the rack. The Lamb crystal filter uses a 500kc crystal (as does the FBX receiver) to match the IF. The AGS-X also moved the BFO frequency control from inside the receiver to the front panel. AGS-X F-151 has the air-trimmers for its IF adjustments indicating its a late-production receiver. I built the metal frame, table top rack based on one pictured in a ham station photo (with AGS-X receiver) in a 1934 QST magazine. There were several variations throughout the AGS' short, two-year production life, mostly involving tube types and calibration procedures. The most significant improvement was the "Single Signal" AGS-X that was designed specifically for the affluent ham market (not heavily populated during the Depression.) The installation of the Lamb Crystal Filter allowed the operator to narrow the receiver IF passband considerably to improve copy in the congested ham bands. Also at this time, National started to offer ham bandspread coils for the AGS that allowed tuning the 160M, 80M, 40M and 20M ham bands spread between "20" and "120" (100 divisions) on the Type N dial (scaled 0 to 150 with 270º rotation.) Air trimmers replaced the old compression types used in the IF transformers by mid-1934. By late-1934, even 10 meter coils were being offered for the AGS. The HRO receiver was in the design-phase in the late-summer and fall of 1934 and, with its introduction in October 1934 (and availability by March 1935,) the AGS receivers became obsolete commercially. The AGS-X was available from Leeds at this time (early 1935) for only $123. Although the AGS-X was a great receiver in 1933, the HRO receiver's outstanding performance had antiquated the AGS-X in a little more than one year's time. Radio Manufacturing Engineers, Inc. started in business in the early thirties, founded in Peoria, Illinois by two hams - E. Shalkhauser, W9CI and Russ Planck, W9RGH. 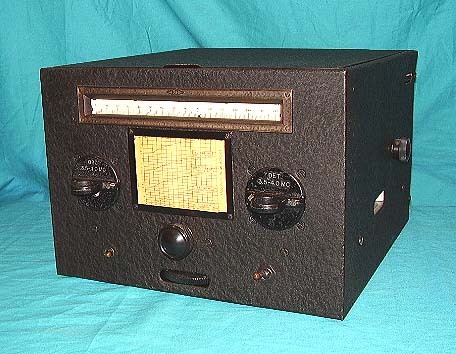 Their first receiver, the RME-9 was designed in 1932 and was on the market by 1933. The RME-9 was a nine tube receiver with a single airplane-type tuning dial and an R-meter for measuring relative signal strength. The RME-9 featured a tuned-RF stage, two stages of IF amplification and a built-in power supply. The receiver was compactly-built onto a stout chassis made out of aluminum extrusion with the overall size of the receiver being quite small (19"W x 9"H x 10.5"D.) After some months of production and about 100 receivers produced, RME revamped the "9" and introduced the improved RME-9D. 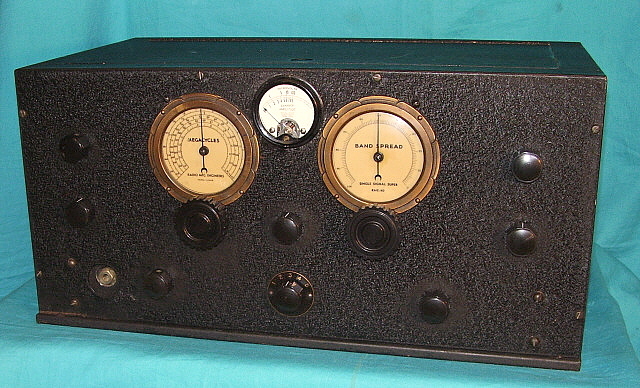 The RME-9D incorporated electrical bandspread and thus used two airplane-type dials with the R-meter between the two dials. Nine tubes were still used since the basic design remained unchanged. Five tuning ranges were provided with frequency coverage from .54mc up to 23mc. The tubes used were 58 (4), 57 (1), 2B7 (1), 2A5 (1), 24A (1) and 80 (1.) . Selling price was usually around $112 from discount houses. The RME-9D was produced from late-1933 up to the introduction of the RME-69 in November 1935. There are some minor variations that are encountered with different types of knob sets being the most common. This especially relates to the tuning knobs with the large "RME-69" type tuning knobs often found on late versions of the 9D. Like many "Depression Era" receivers, it is common to find examples of the RME-9D with modifications added. The tuning and bandspread dials are relatively small and the nomenclature is miniscule and difficult to read but the dial illumination does help. For its time, the RME-9D was a first-class receiver that introduced what became the "basic necessities" for amateur radio receivers - built-in TRF stage, Carrier Level meter, panel operated BFO, Crystal Filter and Bandspread tuning. Although not necessarily the first receiver to incorporate any of these individual features, the RME-9D was the first receiver to use all of the features together as "standard equipment" and with no external assemblies necessary other than the loudspeaker. This rapidly became more-or-less "the standard" for all communications receivers for the next two decades. The RME-9D shown in the photo is an all-original, late production version with a serial number of "431." RME receivers had a paper label on the bottom of the cabinet with the calibration date hand-written on it. The date on this receiver's tag is 9-12-1935. This is about two months before the introduction of the RME-69. Since this receiver is very late in the RME-9D production and has a serial number of 431 one can infer that the total number of RME-9D receivers built is probably around 500. The scant number of RME-9D receivers encountered today seems to confirm that production levels were very low. In March 1933, National introduced the FB-7, a seven tube scaled-down and economically-built version of the AGS, offered so hams could buy a superheterodyne at a realistic price, (about $65 with accessories.) The FB-7 eliminated the RF amplifier and the AVC circuit of the AGS. Additionally, the 6.3 volt tubes of the AGS were replaced with 2.5 volt tubes in the FB-7. The extensive use of aluminum found in the AGS was replaced with sheet metal chassis and cabinet in the FB-7. The receiver used plug-in coils that are similar to the AGS coils. There were six general coverage coils available and identified by the prefix "FB" and the letters AA, A, B, C, D and E (AA was the 10M coil set covering 18mc to 34mc.) Or, the ham could purchase a bandspread set of coils (ID prefix "AB") for 160, 80, 40 and 20 meter coverage. The FBX Single Signal model added a crystal filter to the receiver with the controls accessible on the right side of the receiver cabinet. The FBX came out after James Lamb's article in QST about Single Signal receivers and crystal filters. The IF was 500kc for the FB-7 and approximately 495kc for the FBX depending on the particular crystal used in the Crystal Filter. The BFO frequency control is a knob on top of the BFO coil can and is accessed under the lid. A matching National pre-selector was available, the model PSK, that added a TRF stage to reduce the image problems but it required its own set of plug-in coils. The PSK was usually bolted to the right side of the FB-7 using standoffs - long standoffs if it was an FBX so the operator could have access to the crystal filter controls. Though many hams preferred using earphones, the FB-7 would drive a loud speaker quite well with the proper power supply. At least three different models of AC power supply were offered that could operate any of the FB-7 receivers but the 5897AB was recommended since it provided sufficient B+ voltage to allow the type 59 audio output tube to develop sufficient power to drive a loud speaker - about +240vdc. Most of the 5897AB power supplies that were sold with FB-7 receivers have a tag on top stating the the 5897AB was "designed especially for the FB-7." An "A" suffix to the FB-7 or FBX designation denotes the use of National's improved IF transformers that utilized air-spaced trimmers rather than compression trimmers. 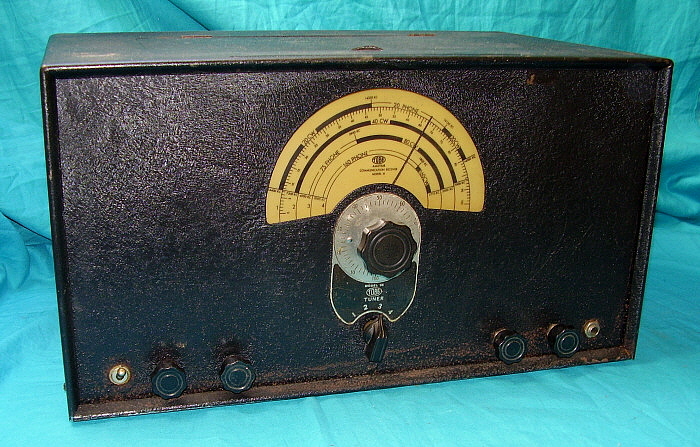 The receiver shown is an FBX-A from 1934. The FB-7 and its variations were very popular and found in many ham shacks in the mid-thirties. Emmitt Patterson started Patterson Electric Co. in 1920 but renamed the company in the mid-twenties as Patterson Radio Company and began selling radios as a dealer. Around 1930, Patterson began building his own All Wave entertainment radios at the Gilfillan plant in Los Angeles. Patterson decided to enter the short wave amateur communications receiver market in 1933. Introduced in May 1933, the PR-10 was designed by Engineer Ray Gudie and featured a 10 tube circuit with R-meter, IF gain control (no RF amp), single 59 audio output built onto a chrome plated chassis. Performance was very good (especially for 1933-34) but by adding the PR-10 Pre-selector, with its two RF amplifiers, one could have a first class receiver. The initial models were slightly different and were designated as the "ALL-WAVE 10." The AW-10 didn't have a chrome plated chassis or the Manual Gain control (the AVC was always on - like a broadcast radio.) The AW-10 was probably produced for a few months before it was replaced with the redesigned version designated the "PR-10." The updates included the ability to disable the AVC allowing control the front end gain manually. This was particularly necessary for good CW reception and, at the time, virtually all ham communication was by CW. Other upgrades that were incorporated by 1934 were the reduction of the BFO coupling capacitor value to allow more sensitivity for CW reception and changes in the AVC time constant capacitor. With the designation PR-10, the chassis was then chrome plated. The PR-10 Pre-selector didn't change during production although there are some variations in coil diameter and under chassis component placement depending on early or late production. Like other West Coast radio builders, Patterson's documentation was never updated therefore the "one and only" schematic has several errors when compared to the actual production models. 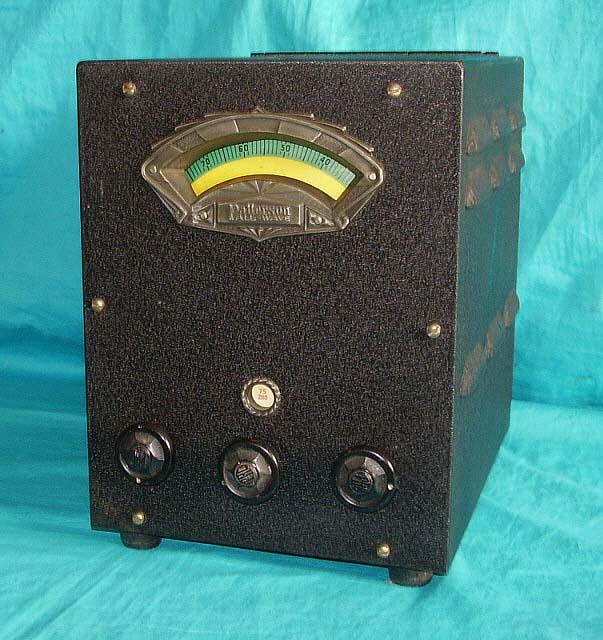 The Patterson PR-10, along with the RME-9D, was one of the first communication receivers to offer a carrier level meter, band spread tuning, band switching (rather than plug-in coils,) stand by switch and built-in power supply. The only "standards" lacking were a crystal filter, a front panel frequency control on the BFO (the frequency control was under the lid) and a tuned RF amplifier. The latter was available if the Pre-selector was used. Overall, the PR-10 was an excellent performer that was reasonably priced and was found fairly often in ham shacks during the thirties, especially in the west. The PR-10 listed for about $120, though most dealers sold the PR-10 for $70. According to Patterson, total production was around 70,000 receivers - an incredible claim. Supposedly, the majority of production was sent overseas to Asia which could account for the relative scarceness of the PR-10 today. The serial numbers seem to indicate a different story however as it is difficult to find a PR-10 with a serial number higher than 10,000. The first communications receiver I owned (in 1965) was an old PR-10. Unfortunately, I decided to replace the 58 and 57 tubes with metal octal tubes, hoping for better sensitivity. The end result was a receiver that was basically non-functional! In 1985, I obtained another PR-10 and this one I restored correctly. It appears in Ray Moore's "Communications Receivers" Fourth Edition. The PR-10 shown in the photo above is the third one I've owned having purchased it from a museum visitor in 2005. It's had a long, well-preserved life having spent all of its time in Nevada. I fully restored this third PR-10 and the Pre-selector in 2016 in order to write a comprehensive web-article on Patterson Radio Company and the PR-10. The RCA Superheterodyne License and Gilfillan Bros., Inc. 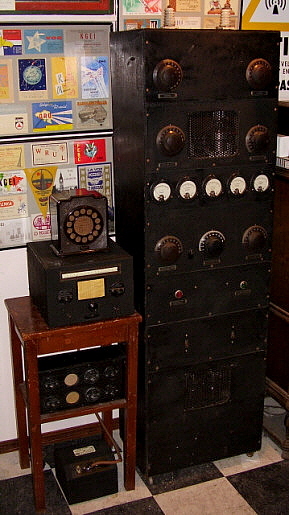 In the 1920s, the "Radio Group" (an un-official name for the cross-licensed corporations - General Electric, Westinghouse, AT&T, United Fruit Company and RCA) had control over most of the important radio patents and had excluded all non-licensed companies from building superheterodyne receivers by threats and law suits. The Superheterodyne patent had been purchased, along with the Regenerative Detector patent from E. Armstrong, by Westinghouse in 1920. Westinghouse used these two patents as enticement to be invited into the "Radio Group" in 1920. However, GE built all of the superheterodyne radios in the twenties for RCA to sell. RCA began licensing out standard TRF circuits (that had been purchased from Hazeltine) in the late twenties. Early in 1930, the government filed an anti-trust suit against the "Radio Group" essentially taking control (and patents) away from GE and Westinghouse. RCA was given the Superheterodyne Patent at that time as part of the settlement. The settlement also stipulated that RCA would now have to license other manufacturers to build superhets. Every major radio company had to have the RCA Superheterodyne License in order to remain competitive even though there were royalties and other conditions with having the license. Some of the conditions required that license holders had to produce radio chassis in sufficient quantity and of high quality in order to qualify for the RCA license. This left many small companies unable to qualify for the license due to their limited market, small overhead and the expenses involved in producing high quantity and high quality chassis. Fortunately, for the small radio companies, there was a option in the RCA license rules and conditions that allowed a license holding company to build chassis for other un-licensed companies. Gilfillan Bros., Inc. in Los Angeles, California had the only RCA Superheterodyne license in the West (exclusive license holder for 11 Western states.) This arrangement was the result of a 1928" face to face" confrontation between S. W. Gilfillan and David Sarnoff, (who admired Gilfillan's determination.) At the time of the Sarnoff-Gilfillan meeting, James G. Harbord (RCA President from 1922 to 1930) had taken a leave of absence to campaign for presidential-candidate Herbert Hoover and that left general manager, David Sarnoff, in charge. The Sarnoff-Gilfillan arrangement was the offer of exclusive RCA licenses in exchange for closing all Gilfillan operations not in the Western States. Specifically, the Gilfillan plants in Kansas City and New York City were the apparent target of the agreement. At the time, this licensing was mainly for TRF circuitry but, by 1931, the superheterodyne was added to Gilfillan's exclusive licensing. Gilfillan allowed subcontractors to build their own chassis on the second floor of the Gilfillan plant. This included Los Angeles companies such as Patterson, Breting, Jackson-Bell, Packard-Bell, Kemper and Pierson-Delane along with dozens of other smaller companies, all in the Los Angeles area. During the early 1930s, the policy was not very strict and the radio didn't have to be assembled by the licensed company. The subcontractor was protected because he was building the radio using parts supplied by the licensee and the building process was supervised by the licensee. Some companies (including Gilfillan) allowed sub-licensed companies to supply their own assemblers, set up their own production lines, utilizing plant stock and tools, using plant floor space at the license holder's company. The sub-licensing policies allowed many small radio companies the start-up operations because the major expense, that is, building a factory, real estate, equipment and stock expenditures were eliminated. This left the new radio company/sub-contractor to only have to hire personnel and have a good design to build. During the Depression, this really was the only option for a small company to produce quality radios, be able to sell those radios and profit from that business. Also, those profits were shared by the licensed company (5% to Gilfillan which they split with RCA.) The subcontractor licensing allowed everyone involved to profit during the difficult economic times of the 1930s. In 1940, RCA decided that there was not enough quality control on the chassis produced for the smaller companies by the license holding companies and began to stop allowing the sub-licensing option. The RCA license structure was also changed at that time to allow most smaller companies to obtain their licenses direct from RCA. However, Patterson had quit the radio business in 1939 and his major West Coast competition, Breting Radio Manufacturing, quit the radio business in 1940. Some homebrew ham equipment was so well-engineered and so well-built that in some cases it's difficult to image that the gear isn't commercially built. It's extremely fortunate that some former owners have had the foresight to save and preserve these superior examples of amateur engineering. The W7FM Transmitter-Receiver is an amazing example of efficient packaging and shows the creativeness that was necessary during the Depression to build quality, compact, useable gear. 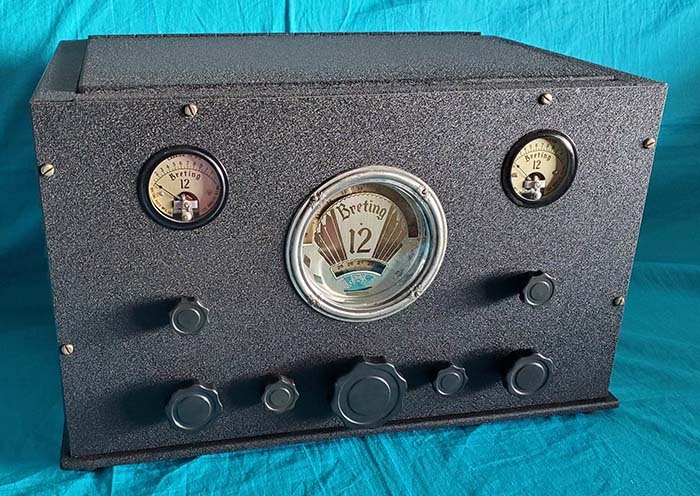 W7FM, Don Thorton of Spokane, Washington, decided to build a two-tube regenerative receiver and a four tube (crystal controlled oscillator, buffer and parallel power amplifier) CW transmitter both with their own individual AC power supplies. Not particularly unusual in the early thirties. But how about installing everything into a 1927 Kemper Radio Company K-5-2 cabinet. 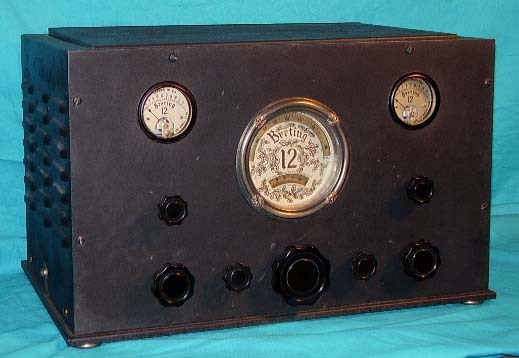 The original Kemper K-5-2 was a portable five tube battery operated TRF radio in a leatherette covered wooden box that featured a removable front cover and removable back cover. W7FM built the two AC power supplies into the lower section of the K-5-2 cabinet where originally a folded horn speaker and battery storage was located. In the upper section of the cabinet as viewed from the rear (shielding removed for photo) on the right is the two tube receiver and to the left is the four tube transmitter. What is amazing about the packaging is that full shielding was accomplished by building the entire TX-RX into a metal box that fits exactly into the Kemper K-5-2 cabinet. The entire receiver and each section of the transmitter are contained in shielded compartments. Looking deceptively light-weight, this TX-RX runs the scales up to an incredible 70 pounds! Full metering is provided with three panel meters. Six plug-in coils are required with two needed for the receiver and four for the transmitter. There are two complete sets of coils that were built for the TX-RX. 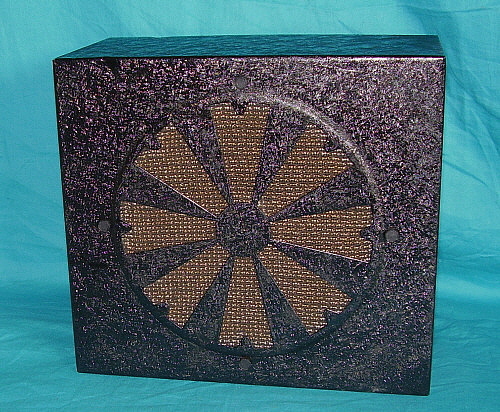 Behind the speaker grille (with the "W7FM" embroidery) is an armature-pin speaker for receiver output. Separate receiver and transmitter antenna inputs are used. The receiver uses a type 27 for the regenerative detector and a type 47 for the audio output. The transmitter uses a 59 crystal oscillator, a 46 buffer stage and a pair of 45s in parallel. A hand-drawn schematic of the transmitter shows parallel 10s but Don Thorton probably decided that the 7.5vac filament voltage required for the 10s was impractical and went with 45s to keep all of the filament voltage requirements at 2.5vac. An 83 is used for the transmitter power supply rectifier and a type 80 is used in the receiver power supply. 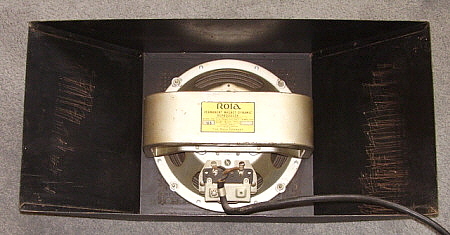 Note that the receiver power supply is built from old RCA Radiola parts. Thorton probably built his TX-RX around 1934 judging by the circuits and the parts used. Don Thorton became an SK around 1940 and his son, Doug, was too young to remember his father using this TX-RX. Doug himself tried it out when he was in high school. The receiver worked fine and a friend listening on another receiver in town "thought" he copied the signal from the transmitter. Doug didn't have a license, so he didn't perform more than just the one test. Since then, the TX-RX has not been powered-up. Doug Thorton donated his father's homebrew TX-RX to the WHRM in October, 2010. Stay tuned for updates on this unit's functionability as we'll attempt to have it running soon. National announced the HRO receiver in October 1934 and began production in January 1935 with the first receiver deliveries happening about March 1935. James Millen (at National) headed the mechanical design team and Herbert Hoover Jr. (on the West Coast) was in charge of the electrical design team. Millen and Hoover believed the best receiver performance was obtained using plug-in coils thus eliminating the losses found in most bandswitch circuits of the day. The HRO design also used a separate power supply in order to keep heat and hum out of the receiver. The HRO also used only the necessary number of tubes and all stages are run at maximum efficiency which lowered thermal tube noise and increased the signal to noise ratio. 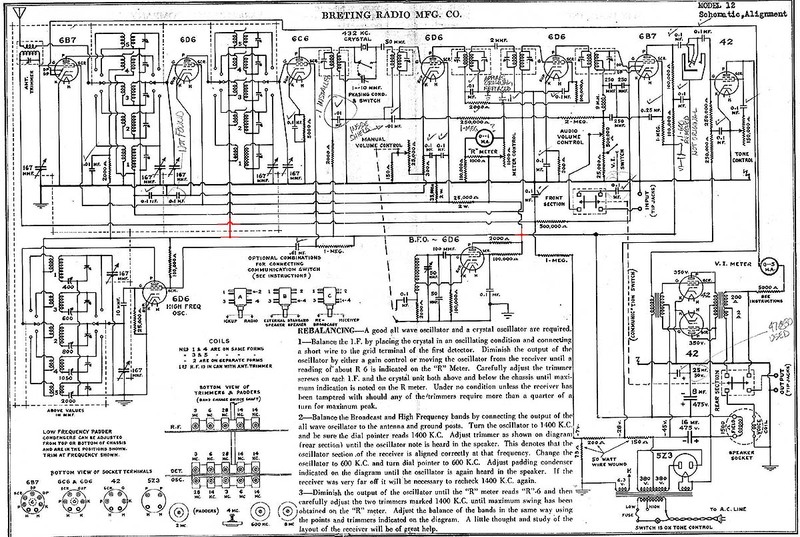 Many hams regard the HRO as the best of the pre-WWII ham receiver designs because of its great sensitivity with low internal noise along with its tremendous bandspread capabilities available on 80M, 40M 20M and 10M. It was an expensive receiver selling for about $200 with power supply and four coils in 1936. The HRO used 10 tubes (nine in the receiver and one in the PS) and featured double pre-selection on all of the plug-in coil sets. Plug-in coils for several frequency ranges were available and either general coverage or amateur bandspread were selectable on the amateur coil sets (A, B, C and D sets) by relocating four "jumper screws" on top of the coil assembly. The micrometer dial was based on a Sperry Gyroscope design (National's version was successfully patented) and the National version was very smooth in its operation. The PW-D (National's term for the micrometer dial) had a scaled range of 0-500 that gave the user the equivalent of a linear dial twelve feet long. The precision nature of the PW-D readout allowed for extremely accurate reset capabilities. The PW-D numerical readout was correlated to frequency graphs that were mounted on the front of each plug-in coil set allowing the user to determine the receiver's tuned frequency. For hams, the dial readout vs. frequency graph allowed the operator to figure out where he was tuned and was probably as accurate as most direct readout dials of the day. Of course, most hams then were using crystal controlled transmitters and knew their operating frequency anyway. The HRO was one of the first receivers produced to feature double pre-selection, that is two TRF amplifiers, which reduced images to a minimum. Many hams were using earlier-type receivers with a separate after-market pre-selection to achieve what the HRO was already equipped with. The band spread feature was based on what National had been offering with the FB-7 and AGS receivers. The HRO increased the band spread to the point where each of the 80M, 40M, 20M and 10M bands were covered in 400 divisions of the PW-D. This was equivalent to a linear dial that was nine and a half feet long. There were several minor changes incorporated into the HRO from its 1935 introduction up to WWII. The HRO shown in the first photo is from the first production run and shows some of the earliest features of the initial run HRO receivers, that is, coil assemblies with white background graphs with black nomenclature, no pilot lamp, a nickel plated micrometer dial, black chassis, round IF cans, a "NC" on the dial pointer and a non-illuminated S-meter with a pearl-button push switch. The HRO Senior shown in the next photo is serial number N-130, built in June 1936, showing many of the changes that had been incorporated by the 10th production run. The last photo shows how the HRO Senior looked by 1940. 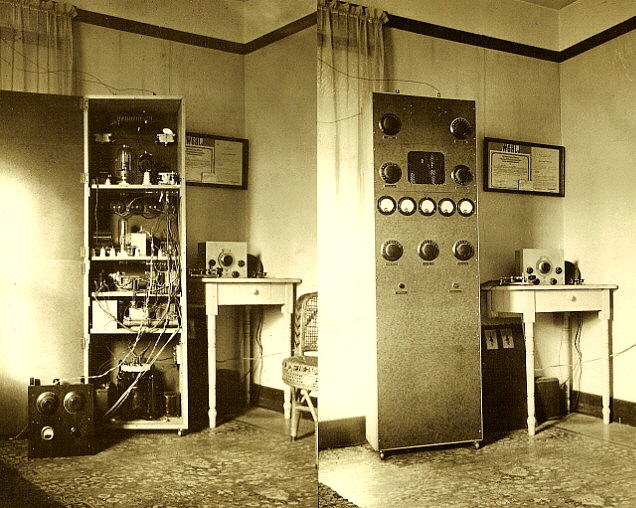 In 1936, the HRO Junior (photo to the left) was introduced as a reduced price version that eliminated the S-meter, the Crystal Filter and the bandspread coil feature (also, only one coil was included in the discount purchase price of $99.) With the introduction of the HRO Junior, the standard HRO became known as the "Senior." Also in 1936, the nickel plated tuning dial was changed to a black* painted lacquer version, chassis paint went from black to gray and the IF transformer shields were changed from round cans to square cans. 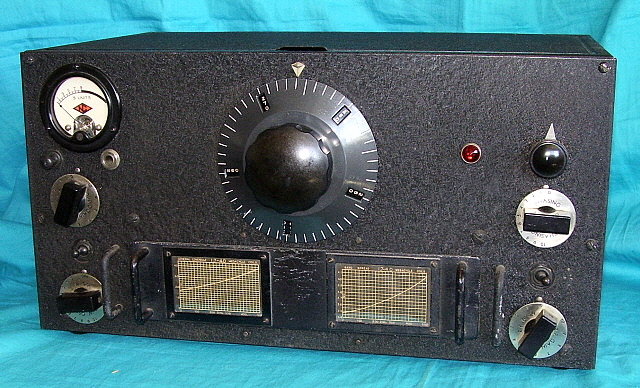 In 1937, the S-meter became an illuminated unit and the following year the identification tag was added to the upper right corner of the panel. The HRO shown in the last photo to the right is a 1940 HRO Senior (SN 463-K) with plug-in crystal. This version is how the HRO looked from 1938 up to about 1941. From this point and into the middle of WWII, the HRO doesn't change except that some late models will be found with a National "bar knob" for the Selectivity control rather than the round point knob. For details on the WWII HRO versions go to "WWII Communications Equipment." For details on the post-WWII HRO receivers go to "Post-WWII Ham Gear." Navigation links are in the Index at the bottom of this page. "National Co.,Inc. - HRO Communications Receivers - 'The Cream of the Crop" in the index at the bottom of this webpage. "When the transmitter was keyed all of the meter needles swung together and the mercury rectifier tubes flashed their blue light. When the key was held closed the plate of the final amplifier Heintz & Kauffman HK-354 would glow red! WOW!" Inside the transmitter the circuit is a crystal-controlled 6L6G oscillator that can be front panel switched to three different plug-in crystals. The buffer stage uses a Western Electric 211-D and the final amplifier is a Heintz & Kauffman "Gammatron" HK-354. The transmitter is CW only and originally ran 1 KW input power or about 700 watts output power. The PA plate condenser is homemade and was built by a machinist (the father of a friend) who made a gift of the precision made condenser. The plate transformer was a salvaged "peg-pole" transformer that was used to provide around 4000vdc on the plate of the HK-354. Unfortunately later in the transmitter's life, the original plate transformer was removed to lighten the total weight for easier moving. photo above: 2 photos - The W6HLJ Xmtr as it looked in 1935. Note that it is not yet painted. I've found a very nice 3K-0-3K plate transformer that looks similar to the original transformer and can handle 500mA. This level of plate voltage should easily provide about 750 watts input power and about 500 watts output. Whether we will be able to actually have a 2X CW QSO will depend on the level of RFI we encounter considering that the transmitter has absolutely no shielding whatsoever. Stay tuned for further updates as this restoration project continues. Update for July 2013: Al Norberg, at the age of 97, is still a registered EE with the state of California. He recently (June 2013) donated his Speed-X bug that can be seen in the B&W photos and also the National Type-N dial that can be seen on his homebrew three tube receiver that is in the B&W photo. Unfortunately, the receiver was "parted out" years ago but building a duplicate is a possibility. The transmitter has been moved and is now at our new QTH in Dayton, Nevada. The top half of the transmitter is restored but the power supply section is still awaiting rebuilding before a test transmission could be made. Go to our webpage "Telegraph Keys" to see a close-up photo of the W6HLJ Speed-X. Navigation link in the index at the bottom of this page. Paul J. Breting started selling communications receivers in 1935. Breting Radio Manufacturing didn't have the necessary RCA Superheterodyne license so their receivers were assembled at the exclusive "RCA licensed" Gilfillan plant in Los Angeles, California. Breting was able to take advantage of Gilfillan's production processes, stock inventory and tooling while building his receivers. Ray Gudie, who was famous for the Patterson PR-10 design, was Breting's chief engineer. Gudie came over to Breting after a wage dispute with Emmitt Patterson. Gudie felt the success of the Patterson PR-10 should have warranted him a salary increase. Patterson disagreed in a manner that caused Gudie to resign and go to work for Paul Breting. The Breting 12 was Gudie's first major design for Breting and it was introduced in 1935 for just under $100. Circuit Description - Breting's 12-tube superhet circuit featured two RF amplifiers, one tuned RF amp along with a second untuned RF Pre-amp switched in above 7.0Mc, band-in-use dial scaling featuring an articulated dial lamp and rear-projection red translucent dial pointer, illuminated logging scale with rear-projected red translucent pointer, xtal filter, tertiary-connected IF transformers, two meters (R-meter & Volume Indicator meter) and triode-connected P/P 42s driven by a triode-connected 42 - all on a chrome chassis. A phone jack is provided on the left side of the receiver and loudspeaker four-pin socket is on the rear chassis apron. An Antenna Trimmer (only connected on the two highest frequency tuning ranges) was located inside the Antenna Input coil can-shield and consisted of a screwdriver adjusted compression condenser accessed through the hole in the top of the can. The Breting 12 circuit also featured many familiar "Gudie favorites" in the design. Like the early version Patterson All-Wave (also designed by Ray Gudie,) the Breting 12's AVC cannot be switched "off." Rotating the Manual Gain (controls the first IF amplifier gain by varying the cathode resistance) from full CW will actuate a switch that only activates the BFO and further rotation CCW reduces the overall sensitivity of the receiver. By reducing the IF gain, the ratio of received signal versus the BFO injection will allow CW reception since the AVC bias is reduced to the point where it doesn't control the sensitivity. The Beat Oscillator frequency adjustment is a knob located under the bottom of the cabinet. Since, in 1935, the only reason for the BFO was CW reception, this "set and forget" concept was fairly popular. Nowadays, tuning in SSB signals will require tilting the receiver back a little to access the BFO knob, setting it to close to the IF frequency and then tuning in the appropriate sideband for proper demodulation. Tuning a SSB signal will have to be accomplished solely by the Tuning dial with the Audio Gain advanced and the Manual Gain reduced to allow the proper ration of BFO injection to received signal strength. And, on the BFO injection,...the BFO is electrostatically coupled with no direct connection to the IF or detector. This accounts for the very light BFO injection, however, the electrostatic coupling was necessary to keep the BFO from blocking the receiver since the AVC isn't turned off. Nowadays, for SSB, the BFO injection has to be at a much higher level and the only method available (without mods) is the reduce the Manual Gain until the signal demodulates correctly. The Breting 12 had a "Communications Switch" on the front panel that (in the "Communicate" position) allowed the ham owner to use the receiver's 18 watt, almost high fidelity audio section, as a speech amplifier to drive a separate transmitter modulator (hi-Z Mike input and 300Z output.) It was also possible to use the Audio Input for a phonograph pickup and with a minor wiring change to the Comm Sw, use the Breting 12's audio section for playing records (wiring shown on schematic.) Normally, by switching the "Comm Switch" to the "Receive" position, the audio was routed thru the loudspeaker (2 ohm voice coil and 1500 ohm field coil doubling as a filter choke in the power supply.) The Volume Indicator meter used the diodes in the 6B7 RF Pre-amp tube to rectify the audio from the 300Z tap on the AF output transformer. A switch (labeled "Volume Indicator" on the schematic) located on the AF Gain control switched in a fixed 25K resistor (at full CCW) that would provide a "fixed" audio gain setting that would result in the Volume Indicator meter reading that would be relative to the received signal strength and sensitivity (or the level of the external audio input) rather the the audio gain. This provided a meter indication of relative signal strength for CW signals since the AVC bias and R-meter indication will be inactive when using Manual Gain. If the receiver is operated with AVC with the Audio Gain control somewhat advanced and a strong AM signal tuned in then the R-meter will indicate relative signal strength and the Volume meter will move around indicating relative audio output levels. If the audio amplifier section was being used as a speech amplifier then the Audio Gain control position would determine the transmitter modulation level and the Volume Indicator readings would show relative speech levels. Physical Description - Cabinet is 17" W x 11" H x 11" D. The receiver weighs approximately 50 pounds. The paint is black wrinkle finish however the wrinkle pattern is an extremely fine texture. The front panel is mounted to the chassis by way of four control bushing-nuts. The cabinet is mounted to the chassis with two sheet metal screws on each side. The front panel mounts to the cabinet using six sheet metal screws. The chassis mounts to the bottom plate by way of four threaded, metal covered, circular glides. The metal dial mask had "oak leaves & acorns" decor on the early models while later dial masks had vertical "rays" flanking the "12" on the dial. The cabinet on early versions only had side louvers while the later versions added several one inch diameter holes along the rear cabinet upper wall to provide better ventilation. Breting 12 SN: 28952 - This late version Breting 12 (shown in the top photo) was found in a barn, south of Carson City, Nevada. It was in deplorable condition then due to decades of rodent activity. Fortunately, the vermin were never able to gain access inside the cabinet which left the chrome chassis and components in good condition. The cabinet however required a complete restoration including a new black wrinkle finish paint job. The chassis was electronically restored and works well. Several modifications needed to be removed to return the chassis back to its original configuration. My older Breting 12 SN: 21685 was used as a model with the corrected schematic (link above) also used as a reference. The end result was a nice performing, mid-thirties vintage communication receiver that has good sensitivity, adequate selectivity and impressive audio when running into a large field coil speaker. Photo right shows SN: 28952 chassis after cleaning. Breting 12 SN: 21685 - I've owned the Breting 12 shown to the left for many years. It's the early style with "oak leaves and acorns" on the dial. Unfortunately its chrome chassis is in horrible condition with lots and lots of rust spots and pitting (actually more rust than chrome.) Despite the poor condition of the chrome, the chassis is complete with all parts and is nearly "all original" underneath. Only a couple of resistors and a few capacitors have been replaced over the years. The bottom plate was entirely missing but I replicated a replacement using the bottom plate from a piece of telephone test equipment. The cabinet is missing the left side lid stop so the lid sags a little on the left making it difficult lift the lid up once it's closed. Paint on the cabinet is only fair having been touched-up sometime in the past with over-sprayed flat black paint. Even the mounting screws were sprayed. I've never bothered to rebuild or restore this particular Breting 12 because of the cosmetic condition problems. Luckily, that's preserved the actual originality of the chassis for future reference. However, this early Breting 12 could easily become a functional receiver. Patterson introduced their 16 tube receiver in 1935. After engineer Ray Gudie left Patterson over a wage dispute, Emmitt Patterson tried engineering the new PR-12 Communication Receiver but soon discovered he was completely out of his element. Though the PR-12 Communication Receiver appeared in a few advertisements in late 1934 it was never in production. A few prototype PR-12 Communication Receivers have turned up but they appear crude and not like a true production receiver. Also, Patterson did produce a 12 tube All Wave receiver that was generally housed in a floor model wooden console cabinet and this chassis is sometimes erroneously referred to as the PR-12. The PR-12 Communications Receiver was a different design that probably never went into regular production. Even though the parallel RF amplifiers are unconventional and no other manufacturers ever tried to market the configuration - the PR-16C is a good performer with good sensitivity, nice mechanical bandspread and powerhouse audio. Built at the Gilfillan plant. * This PR-16C belonged to W6BBK, who bought it new in 1936, using part of his WWI veterans bonus to fund the purchase. In the 1930s, Walter C. Doerle of Oakland, California, came up with several types of regenerative detector receivers for the "homebrewer." Hugo Gernsback published a book that was titled "Four Doerle Receivers You Can Build" which was apparently very popular. In fact, the Doerle-circuit receivers became so popular with "homebrewers" that some builders started "Doerle Receiver" clubs. The receivers generally were a regenerative detector in combination with a single stage of audio amplification. Usually, type-30 tubes were specified but 201A tubes were also popular (although they didn't have the gain that type-30 tubes did.) To keep costs down, the Doerle receivers were always battery-operated. Audio reproduction was for a Hi-Z headset. Like any homebrew or kit, Doerle receivers are unpredictable as performers. Most homebrew builders weren't radio engineers or technicians. They weren't experienced assemblers like those that worked in radio factories so many homebrewers lacked the basics in good soldering ability. Most homebrew builders during the Depression didn't have any test equipment. Careful winding of the coils required experience and well-made coils helped to provide the best performance from the simple Doerle circuit. Since many homebrewers lacked basic electronic skills, few adhered to layouts or instructions so most of the receiver wiring will have a variety of problems from lead dress and component placement to fundamental wiring errors. As expected, the Doerle Globe Circler shown above doesn't work all that well. It was mechanically well-built using several pieces of Atwater-Kent radio parts salvaged from mid-twenties sets. The builder did have a lot of confidence in his ability since much of the construction was assembled with glue and nails preventing any disassembly to check wiring and quality of workmanship. The use of an iron vane meter to monitor filament voltage was a very nice touch. At one time there may have been a second coil for other frequency coverage but the one coil that is present allows tuning from approximately 3.0mc up to about 6.0mc. Since the regenerative detector has very little isolation from antenna effects, this Doerle Globe Circler prefers a fairly short antenna - fifty feet seems best. Longer antennae add so much inductance to the regenerative circuit there isn't enough plate tuning to effect regeneration. The problem may be due to the coil construction which is very poor and the antenna effect maybe due to over-coupling in the way the coil is wound. However, the Doerle Globe Circler does receive 5.0mc WWV and a few SWBC stations. A few SSB 75M hams have also been received. This Doerle Globe Circler would certainly benefit with a complete redesign and rebuild but then it wouldn't be original and serve as an example of the typical 1930s homebrew regen-set. Many radio enthusiasts still build Doerle regenerative receivers. Some builders prefer to use mostly vintage parts while others, trying to get "the most" out of the circuit, use modern equivalents. There's ample info on the circuits and performance reviews on the Internet. Bill Halligan bought Silver-Marshall Mfg. to start The Hallicrafters, Inc. and began offering receivers in 1933 with the first receiver designs using TRF circuits. 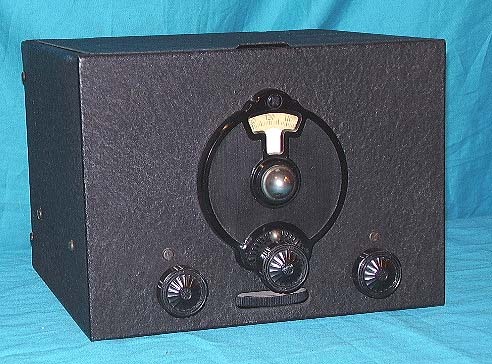 All of the early Hallicrafters receivers were built by contractor radio companies, like Howard Radio Company and other contractors, since S-M didn't have a manufacturing plant or the RCA Superhet license. Halligan formed a partnership with Case Electric to use their license and plant in early 1936 and shortly thereafter purchased Echophone to acquire their RCA superhet license and manufacturing plant. 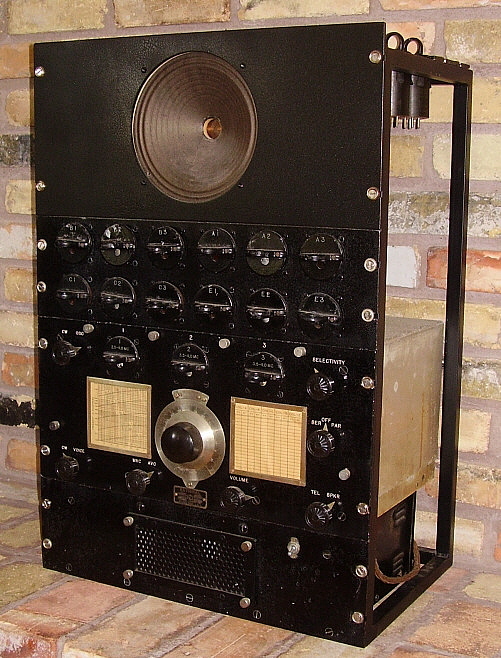 The SX-9 was offered in late 1935 through early 1936 and featured a built-in speaker, nine metal-type tubes and Aladdin iron-core IF transformers in a superheterodyne circuit with bandspread. All SX-9 receivers were built by contractors and the serial number tag will have a manufacturer code number for identification. Though the SX-9 was a significant improvement over earlier TRF models and performance is quite good, it still retained a somewhat crude "amateur" appearance. Like most Hallicrafters receivers, the SX-9 was designed to be built from "purchased parts" supplied by various component companies. This design and manufacturing method allowed Hallicrafters to offer great performing receivers at reasonable prices. Radio kits were one way an enthusiast could purchase a fairly advanced receiver and only pay a fraction of the cost of a commercially-built receiver. Kit-building was very popular during the twenties when radio broadcasting was starting and the cost of a factory-built radio averaged over $100 (and that didn't include the accessories like tubes, loudspeaker or batteries.) By the 1930s, kit-building had lost some of its appeal since many broadcast radios were inexpensive by then. 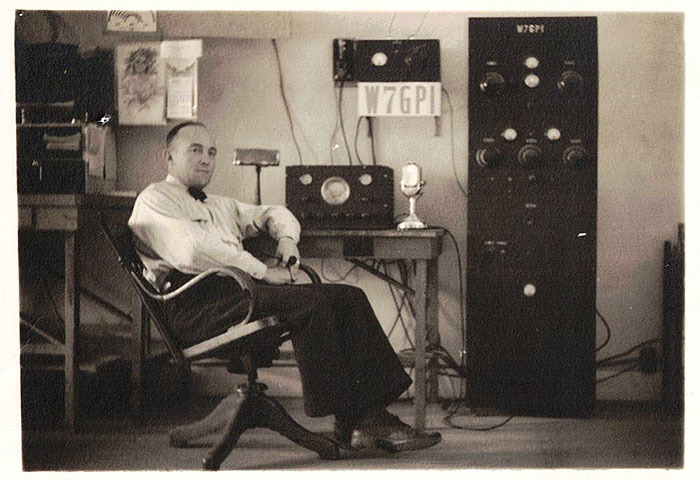 Amateur radio had been the domain of the "homebrewer" - someone who built their own equipment. By the mid-1930s, amateurs had accepted that the superheterodyne receiver was a superior performer on shortwave and most had decided that these modern receivers were just too complex for the homebrewer to tackle. Factory-built receivers were used in just about all ham shacks while the transmitters used were almost all homebrew. Glenn H Browning had been thinking about easing the complexity of homebuilt receivers around 1934. Just how to construct a kit-type superheterodyne that eliminated some of the more difficult tasks, especially those tasks that required special test equipment, was Browning's goal. He designed a receiver "front end" that used a tuned RF amplifier and a Converter stage with all of the coils necessary for four bands tuning from the AM BC band up to 22mc. Tobe Deutschmann Corporation offered the Browning Tuner (by then called the Tobe Super Tuner) as the foundation of a kit called the "Browning 35" (since it was going to sell in 1935) All of the components including the pre-built and pre-aligned "Tobe Super Tuner" were in the kit, even a loud speaker, for the very reasonable price of $46. The Browning 35 was a general coverage receiver for shortwave listeners, hams and enthusiasts. What the hams wanted was an inexpensive "ham bands only" receiver. Tobe Deutchmann Corporation offered the "Tobe Amateur Communication Receiver - Model H" that was essentially the Browning 35 but only tuning 160M, 80M, 40M and 20M amateur bands in a band spread type of coverage. The Model H used the "Tobe 35H Tuner" that was a version of the Tobe Super Tuner that had a special tuning condenser for band spread coverage of 160M, 80M, 40M and 20M. There was actually some frequency coverage slightly above and below each ham band to allow for reception of a few short wave broadcasters, foreign hams and other stations outside the US ham bands. Since the front-end was pre-aligned, the builder had only to assemble the receiver (Tobe Deutschmann's instructions say "a few enjoyable hours" were required for assembly) and then do a minor "touch up" alignment to the triple-tuned IF and to the front-end. Instructions consisted of five large drawings showing the proper placement of components, a large schematic, written instructions and a booklet. There are a couple of pages that warn assemblers not to use acid or paste flux for soldering or "problems will result." Like all radio kits of the thirties, TOBE assumed that the builder had some experience so "step-by-step" instructions are not provided. The instructions are general information and only convey special information where needed. The builder was supposed to adhere to the drawings and the schematic for proper assembly. The large drawings are numbered 1 thru 5 so the builder would start with drawing #1 performing those tasks and then moving on the drawing #2, so on, until drawing #5 was completed and that had the receiver ready to test. Any detailed mechanical assembly instructions were thought to be unnecessary and that information is only shown in the drawings. The Tobe Model H was available from 1935 up through 1936. The 1935 versions use seven glass tubes. The power transformer had both 6.3vac and 2.5vac windings so the builder could choose either 2.5vac tubes - (2) 58, (1) 2A7, (1) 2A6, (1) 56, (1) 2A5, (1) 80. Or, using 6.3vac tubes the line-up was (2) 6D6, (1) 6A7, (1) 75, (1) 76, (1) 42, (1) 80. There isn't a bezel surrounding the dial on the 1935 models. Instead, a small oval metal plate with logging scale and band select numbers is used. Dials on early versions will have the "TOBE" logo and receiver model information printed below the band scales. The 1936 models will have a large silver metal bezel surrounding the dial, integrated to include the logging scale and band select nomenclature. The "TOBE" logo and receiver model are printed on the bezel. The dial just has the band scales. In 1936, either the seven glass tubes circuit could be purchased or the eight metal tubes circuit could be selected. Also in 1936, a spring-loaded ball latch was added to the cabinet lid. When completed, the Tobe Model H had one RF amplifier, a Converter stage, a single IF amplifier, a single detector, BFO, a first AF stage, an AF output and a power supply rectifier. After alignment the sensitivity was rated a 1uv and with the very selective RF tuning, along with the tertiary link-coupled IF transformers, the bandwidth was fairly narrow. 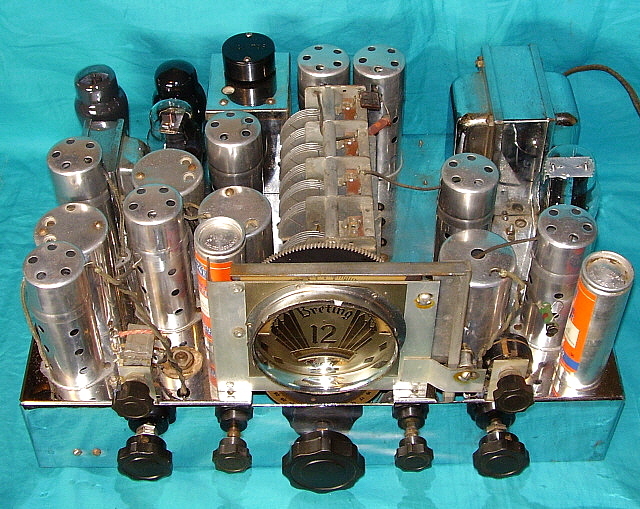 The later 1936 versions of the Model H were also available with air-tuned trimmers for the oscillator circuit for better stability and accuracy requiring the Type 2 LO assembly be added to the 35H tuner which added about $10 to the selling price of the kit for a total of $56 for the metal tube version with air trimmers (called the "TOBE Special.") Tobe Deutschmann mentioned that a Crystal Filter IF transformer that was going to be available but it was never shown in their advertising as an option. Audio output was rated at 3 watts (with either a 2A5, a 42 or a 6F6 output tube) driving an electrodynamic speaker with a field coil resistance of 1750 ohms. Although a speaker was included, it didn't have an enclosure. Complete Wright-DeCoster speakers with enclosures could be purchased to go with the Tobe receivers (see the Wright-DeCoster speaker shown below.) A front panel "standby" switch was provided for the Model H. The tuning dial is removable thru a slot in the top of the receiver cabinet to allow the user to install a customized tuning dial that provided markers to indicate ham "schedules" by call and by day of the week. Besides the main dial logging scale there is another logging scale that surrounds the tuning knob. Twenty divisions on the tuning knob scale equals ten divisions on the main dial logging scale. The dial illumination is provided by a dial lamp that is mounted to the tuning condenser shaft. This provides a "tracking" illumination that follows the dial pointer - very cool. The TOBE "Special" Model H shown in the top photo is a 1936 version "TOBE Special" using all metal octal tubes and utilizing the air-tuned trimmers. Tube line up is 1-6K7 RF Amp, 1-6A8 Converter, 1-6K7 IF Amp, 1-6H6 Det/AVC, 1-6C5 BFO, 1- 6F5 1st AF, 1-6F6 AF Output, 1-5Z4 Rectifier. Along with the receiver I was also able to obtain all of the original instructions including all five of the large drawings, schematic, written instructions and the Browning 35 booklet. Also, the alignment dial and the main tuning dial. The "Special" photo shows the standard tuning dial inserted. Observations on Restoring Radio Kits: Even though the TOBE "Special" Model H kit provided the builder with excellent, large drawings for all aspects of construction along with detailed (for the thirties) written instructions, there is the possibility that any Model H kit is likely to be fraught with problems that have the root cause being the lack of experience and minimal technical expertise of the builder. Most kit builders were not professional electronic assemblers. Most kit builders didn't have soldering skills that were even close to the professional assemblers found in "radio factories." Expect to find poor soldering joints, minor wiring problems, lead dress problems,...on and on. Most kit builders were not professional electronics technicians or engineers. Many didn't own any type of test equipment. You may find that you have to thoroughly go over all of the circuit inspecting for bad grounds due to mechanical assembly problems, poor solder joints, lead dress problems and wiring or component errors. For example, the 1936 "Special" Model H shown in the top photo was basically complete and original having only been recapped in the past. It did function but exhibited several problems, from a fairly high hum level to an AC modulated CW note. LO tracking was poor and couldn't be aligned. The articulated dial lamp assembly was missing. A thorough inspection found so many lead dress, component location and soldering problems that the only solution was to completely "strip out" the wiring and components and start over - this time following the recommended layout using professional wiring and soldering techniques. All of the original components were rebuilt or reused so the "newly built" Model H appears just like it had been assembled following the instructions back in 1936. When finished, the performance was significantly better and also pretty much as described in the booklet. Unfortunately, the Tobe alignment instructions provided are useless since they assume you don't have any test equipment. I aligned the Model H as if it were a standard ham band superhet receiver with a 456kc IF and ended up with a receiver that has very good sensitivity, fair selectivity, vague dial information, very nice audio in the AM mode and average stability for the period. Back in 1936, for the expenditure of around $60 and a few nights of assembly and testing, the talented, experienced and thrifty ham would have ended up with a pretty good receiver at about half the price of a factory assembled receiver. When the TOBE Model H Amateur Communication Receiver kit was purchased a loudspeaker without enclosure was included. For an extra five dollars, an optional loudspeaker was also available for use with the various Tobe Deutschmann receivers, the Browning 35, the TOBE "Special" Model H and the standard TOBE Model H. The loudspeaker was an eight inch Wright-DeCoster electrodynamic speaker housed in a metal cabinet that was painted black wrinkle finish. The field coil DC R was 1750 ohms and the proper audio output transformer was mounted on the speaker frame. A four conductor cable with four pin plug connected the loudspeaker to the receiver. The photo to the left shows a Wright-DeCoster/TOBE loudspeaker that uses an eight inch W-D loudspeaker. The grille cloth was originally silver and black but this example of original grille cloth has faded and discolored to now appear brownish tweed in pattern and color. The "sunburst" grille featured a small metal badge in the center that is missing from this example. The badge probably had the "W-D" script-logo on it.